Katchie Ananda is an international Yoga and Dharma teacher whose leadership in yoga and social change prompted Yoga Journal to name her one of five top yoga teachers making change in the world. 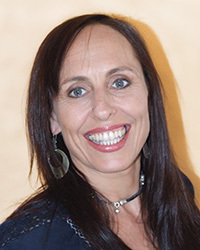 Katchie has 25 years of experience as a full-time yoga teacher and trainer, and is certified in Anusara, Jivamukti, Integral and Ashtanga yoga by Richard Freeman. An avid student of vipassana, she has studied closely with Jack Kornfield, her Buddhist teacher for more than 15 years, and offers retreats and workshops worldwide. She was the co-founder/director of Yoga Sangha, a studio in San Francisco known for practices to awaken the heart. She loves to work with authors and activists and frequently collaborates with Wes "Scoop" Nisker, John Robbins and Julia Buttefly Hill. She is dedicated to raising awareness about human and animal rights, the environment and social justice. She lives in Santa Fe, New Mexico, with her husband Joshua and dog Leelou.